We know that many young people take action with CAFOD, working together to overcome poverty and injustice throughout the world. Many of our partners across the world empower young people to transform their societies. We’re inspired by them, and know that young people in the UK have the same ability to take the lead, which is why we focus on this area of work in the UK, supporting young people to be key influencers of their peers and local communities. 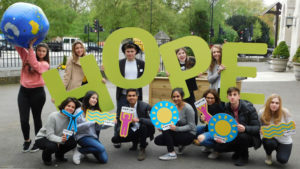 The CAFOD Young Leadership programme is one of the ways we engage a younger audience in our work, offering sixth-formers an opportunity to take the lead by volunteering for CAFOD to make a difference in fighting poverty and injustice. In the weeks before the general election on 8 June 2017, CAFOD supporters across the country are getting involved by speaking to all political parties and candidates about how the poorest communities across the world must be kept in mind during the upcoming election. There are many reasons why supporters choose to get involved and here are some of their stories. Eleanor Margetts, 24, who is currently is a mission and outreach Officer for Wellspring Community, Brighton, addressed CAFOD supporters and MPs at a recent reception that was held in parliament. CAFOD volunteer, Leah Fox, 19, from Newcastle spoke to thousands of young people at Flame 2017 about her experiences of meeting refugees in Lebanon and sharing messages of hope from the UK. Here, she reflects on her experience and encourages others to act. 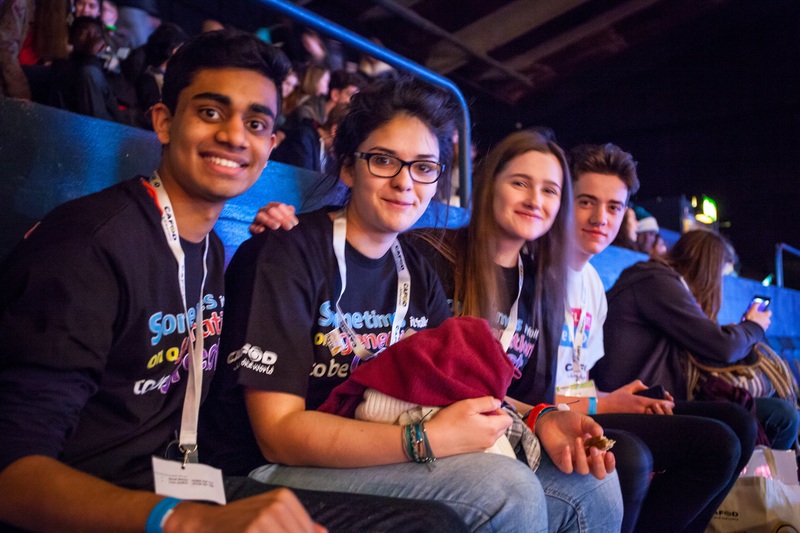 Tell us why you were on stage with CAFOD at the Wembley SSE Arena on Saturday 11 March. Last year I was part of Youth Ministry Team in the Diocese of Hexham and Newcastle, whilst I was there I became a CAFOD Ambassador with representatives from other retreat centres around the country. All around the media, we could see that there were a lot of negative things being said about refugees, and they weren’t being treated in a dignified way. We decided that the Refugee Crisis needed to be addressed so we started talking to the young people we worked with about refugees and gathering messages of hope from them. As a new term begins, CAFOD’s Elouise Hobbs spoke to young leader Jouriz, from Chertsey, about her experiences and advice for those thinking of taking part this September. Over the last academic year CAFOD has worked with 245 young people from across seven dioceses as part of CAFOD’s young leadership programme. These young people spent the year learning about justice issues and developing leadership skills. Collectively they have reached around 65,000 people through their campaigning, speaking at Mass, fundraising, assemblies, blogs and tweets. In the last academic year, Jouriz took part in the CAFOD young leadership programme; when I met her, she was presenting to lower forms from her school about the impact of CAFOD. You recently attended the end of year Young Leadership celebration day with CAFOD. Do you have a moment that particularly sticks out for you? Applications for the CAFOD Gap Year, Step into the Gap, are now open. Julia Corcoran took part in the programme in 2013 /14, and in this blog describes her experience. During my time on the programme my placement was at YMT, (the Youth service for Hexham and Newcastle) running retreats in the Emmaus Youth Village where groups of young people come to take time out, reflect on their lives, realise the impact they have on the world and hopefully the impact God has in their lives. During my time there I had a variety of opportunities to work with young people from leading Morning Prayer, helping to run youth festivals and running workshops, as well as going into schools for assemblies and speaking during Mass in the local parishes and at the Cathedral. 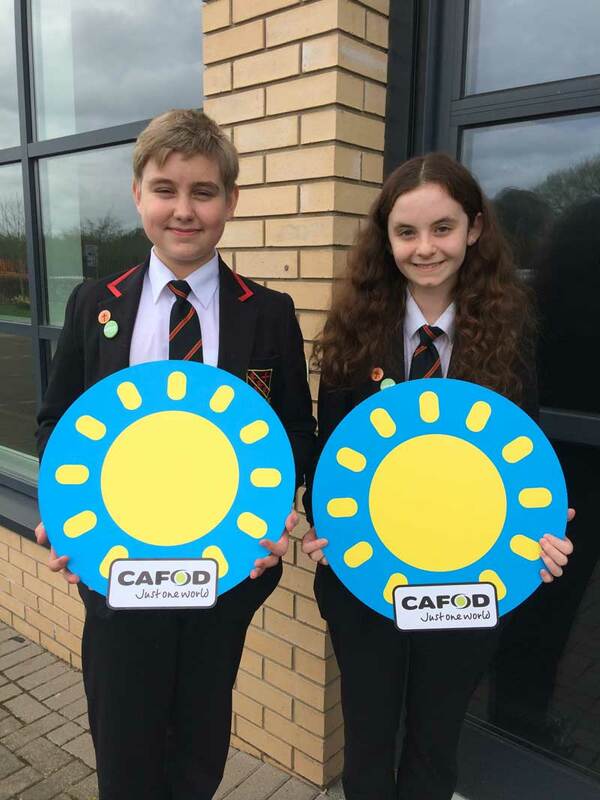 Nathaniel and Remi are CAFOD young leaders and students at St Joseph’s College, Reading. They tell us about their experience at Flame2. As we progress through the season of Lent, it is important that as Catholics we take the time to reflect on how we can contribute to our community. The CYMFed Flame2 event at Wembley Arena earlier this month was an opportunity to reflect along with thousands of other young Catholics. You could feel the presence of God in the hearts and minds of everyone as we gathered to kindle the flame of Christ. Aged 11-18 and want to express your faith? As we took to our seats, the event roared into life with uplifting and exciting music by liturgical dancers and double-Grammy award winning songwriter Matt Redman. Thousands of pinpoints of light from the mobile phones of the audience shone around the arena, as everyone joined together in musical worship. 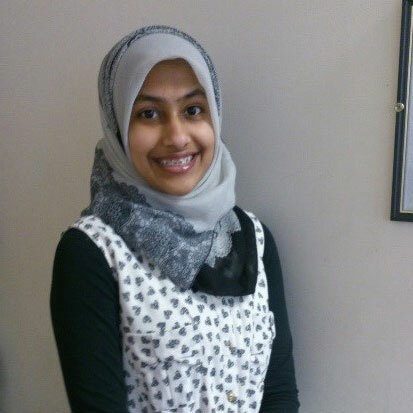 Khudayja, A CAFOD Young Leader from Portsmouth Diocese, explains why she is supporting #Muslims4Lent by Cutting it Out with CAFOD and how her Young Leadership group is getting the whole school involved with campaigning and fundraising. We are a group of Year 12 students studying at sixth form college in Portsmouth Diocese. We believe that we must be the change we wish to see in this world, and this has driven us to become CAFOD Young Leaders. We recognise that the youth of today are the future of tomorrow and therefore it is our duty, as Young Leaders, to make our generation a great one. Are you a young person? Get involved with CAFOD. It has been a wonderful experience getting to know other Young Leaders from across the Portsmouth Diocese through our training sessions, ones that have been beneficial in personal development as well as real-life leadership applications. 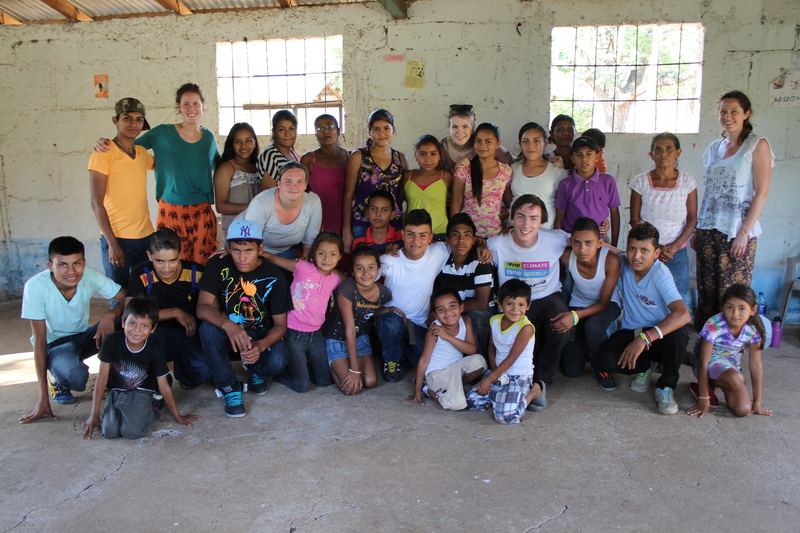 Chris, Bernie, Kate, and Steph from CAFOD’s Step into the Gap programme have written about their week with the Sisters of the Guardian Angel, who work to support young people in Nicaragua. We have just spent a week with The Sisters of the Guardian Angel. They have been involved with CAFOD for many years and work in many communities around Managua and the surrounding regions. They run a three-year youth leadership diploma programme for young adults based on practical experience of helping to lead youth groups and children’s groups. The training is enhanced by CAFOD’s support of Envio, a monthly magazine on social and justice issues and workshops that explore current affairs affecting Nicaragua and the rest of Central America. The youth leaders are encouraged to go along to the workshops whenever they can.